So we're at the point where we've written the code to create a user-defined function. What we need to do now is execute the code and then use the function in a query to make sure that it works! Here we've made sure to choose the Movies database before clicking Execute. To avoid having to remember to select the correct database you could add a USE statement to your code, as shown in the example below. 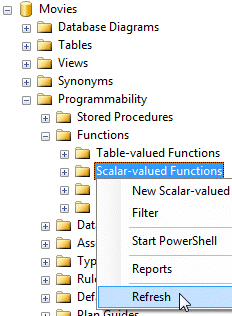 Once your function has been created, you should be able to find it in the Scalar-valued Functions folder of your database. You may need to refresh this folder first in order for your function to appear. Right-click on the folder and choose Refresh in order to see its most recent additions. When you expand the folder, you should be able to see your function listed within. You can even expand its Parameters folder to see the list of input parameters that you have defined. Your custom function is now part of your database. The beauty of a function is that you can reuse it in any query in the database, rather than having to write out the full expression each time. The first time you attempt to use a custom function in a query you may find that its name is underlined in red. This indicates that your function hasn't been recognised by the IntelliSense feature of SQL Server Management Studio. If you hover the mouse cursor over the function name you'll be told that the function isn't recognised. This isn't actually a problem (if you execute the query the function works perfectly), but it is a little disconcerting. To clear the red underlining and ensure that your function name is recognised you need to refresh the IntelliSense cache. To do this, you can choose Edit > IntelliSense > Refresh Local Cache from the menu, or you can press CTRL + SHIFT + R on the keyboard. Choose this option from the Edit menu. Now that you've seen how to successfully create and use a function, what if you want to change the way that it works? The next part of this series explains how you can modify an existing function, including how to delete it entirely if you want to.